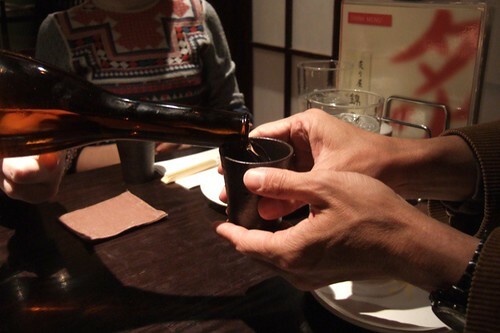 Photo: Friends sharing sake at Aburiya Kinnosuke in New York City. As the cup was raised to meet the bottle, I realized what I had been missing, what had kept me from really enjoying sake in Washington, D.C.—sharing it with old friends and fellow sake lovers. I hadn’t been drinking much sake since I returned to the States. I wanted to taste and enjoy it, but something limbic just wasn’t happening. 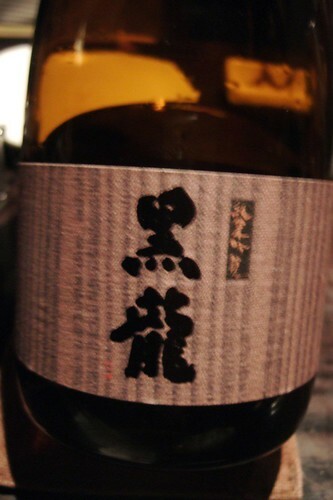 I drank a decent junmai ginjo one day at home, but it felt off. Had I fallen out of love? The air was different, the food was different. Perhaps I was different. I began to think that all those sake memories were only dreams. Perhaps I really didn’t like sake as much as I had thought. I glanced sadly at my tea tansu filled with guinomi (sake cups), each seasonally appropriate, pink hand-blown glass in summer, an autumn Kutani porcelain, winter Bizen-style—a bit of earth and fire. No, this neglect would not do. 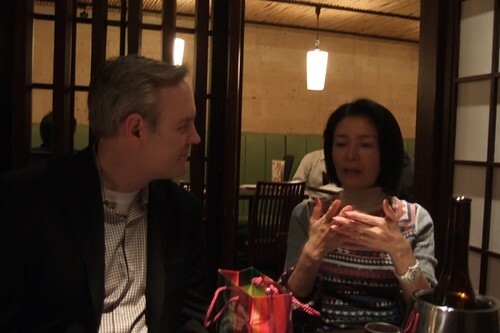 And then my pal Etsuko (Tokyofoodcast) wrote: she and Ted were coming to New York after New Year’s. Would we like to meet the NYC sake gang? Choo-choo, all aboard, we were going to New York! 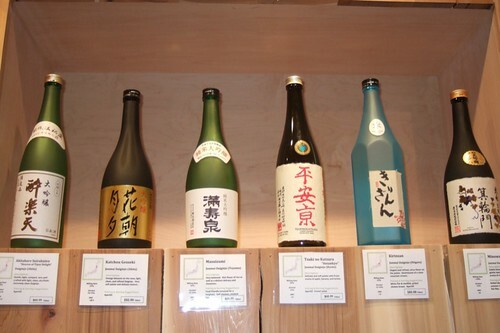 Photo: Sake otaku. Rick, Hiroko, Etsuko, me, and Ted. 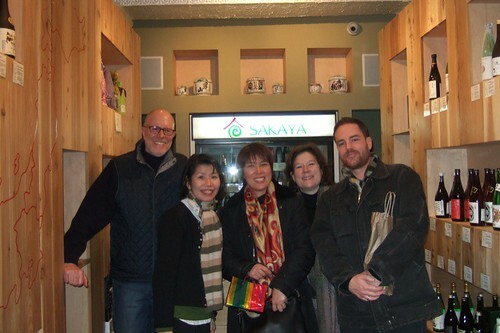 Etsuko, Ted, Carlos, and I started the sake evening by visiting the New York Church of Sake: Sakaya NYC. Rick and Hiroko must have been bemused as we gushed about the beautiful shop and as we cooed over many favorites from Japan, now dressed in new import labels. We made off with a modest haul. The big mail order is to come. Needless to say, if you are into sake and live somewhere near New York, you need to get to this shop sugu ni. Then we moved on to Aburiya Kinnosuke to meet old and new friends and their significant others. 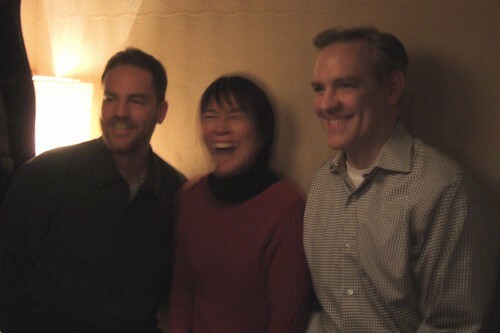 What joy to reunite with Kazuko from the Tokyo Sake Meetup Group and finally to meet Tim from UrbanSake.com. Later Rick and Hiroko arrived to complete the table. Photo: Sake convo at Aburiya Kinnosuke. Photo: Tokyofoodcast and UrbanSake.com. In my mind’s eye, I always see Etsuko laughing. 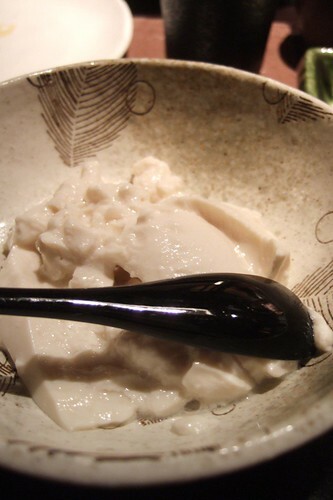 Photo: Homemade oboro dofu (soft “cloud” tofu). Yes, the sake was delicious, but I was suffering from an extremely rare bug that kept me from eating and drinking with my normal gusto. I had tofu, some chazuke (green tea and dashi on rice), and sipped demurely the sakes on offer. Tim has a good recap of the tastings on his blog. Nevertheless, demure or not, I was sipping and tasting a renewal of my enthusiasm for sake and especially for the people who promote it in the States and who just love this mysterious beverage. 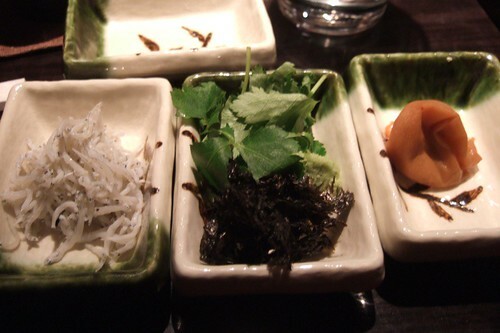 Photo: Chazuke garnishes, baby sardines, parsley (why—I don’t know), some nori, and a lovely, fat, salty umeboshi. I write this at home, between greeting the dishwasher repairman and taking down the Christmas decorations—mostly thinking of sake in 2009. Thank you otaku for helping me back to the sake fountain of happiness. Onward! What a wonderful time you must have had! It was so great to see you both again. It was the perfect ending to our NYC visit. and then fireworks over the Statue of Liberty. Or, am I always smiling with a sake bottle? It was so nice to have a chance to catch up with you and see everyone to share some sake time in NYC. Hope you are feeling better by now. That picture of Etsuko captured just the right amount of blurriness!